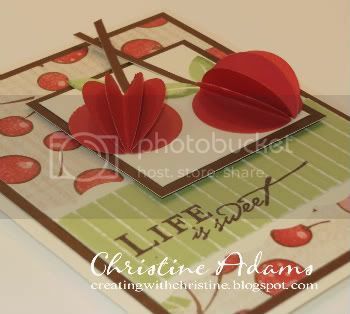 When I saw this card on Vicki's blog, I knew I had to DROP EVERYTHING AND RECREATE IT RIGHT AWAY!!! Isn't it stinkin' cute???? I changed it ever-so-slightly. I used the Passages WOTG kit stamp set "Lifetime" for the sentiment. Also used Cocoa embossing powder for the sentiment. I stamped my leaves in Sweet Leaf ink and rolled the bottom edge in Olive ink using the Cherry-O WOTG kit stamp set "Bowl of Cherries". (The paper I used on this card is included in this kit.) And for the first time in a LONG TIME, I didn't do any ink distressing! (Which seems to be my favorite distressing technique!) Instead I dry embossed the Sweet Leaf cardstock then sandpaper distressed it before embossing the sentiment. 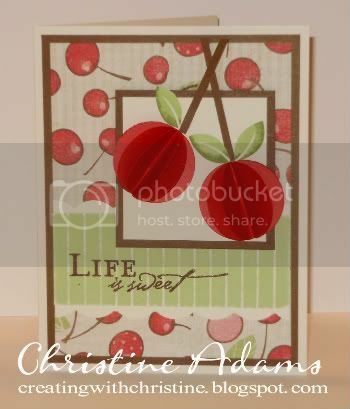 Also, like Vicki, I used our new 1 1/4" circle punch to create the cherries. There are 3 circles, folded in half, for each cherry. You gotta try this yourself!